August begins a new league competition for the National Dog Agility League. Later today we will be publishing League Rules and Stipulations for a three-month league, August to October 2015. We’re growing the league. If you would like to join in the competition, it’s an easy matter. There are no costs associated with playing except for nominal recording fees. In the U.K., there is a dog agility class called Helter Skelter. The game is named after a children’s ride at parks and fairs where a slide spirals down the side of a tower. This game is extremely popular with dogs and handlers alike. This game is a bit of a combination of Helter Skelter and Time Warp. The course is designed as a Helter Skelter spiral, testing a handler’s instincts for knowing when to have a foot on the gas, and when to have a foot on the brakes! The Time Warp element, of course, is a subtraction from the overall score for working the dog at a distance. 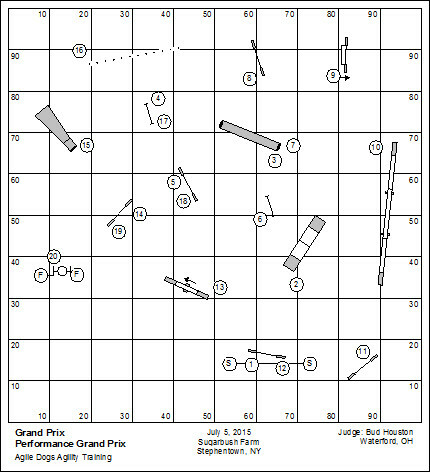 This is a simple numbered course that will be judged Time, Plus Faults, Less Bonus. 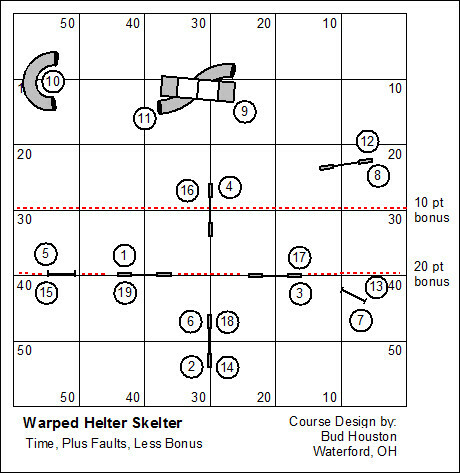 The course shows two bonus lines. If the dog can perform #8 through #12 with the handler remaining behind the containment line at 30’, the bonus will be 10 seconds. If the handler stays on the other side of the 40’ line, the bonus will be 20 seconds. Otherwise, it’s just a numbered course. Follow the numbers; keep the bars up; and hit the paint. The National Geographic Channel has shown some interest in Top dog and the National Dog Agility League. Early indications are that Nat Geo might be interested in starting Top Dog as an internet-based streaming program. And as participation in the program grows they would consider moving it to on air programming. Bishop-Lyons is working hard to develop the relationship with Nat Geo. I’ll keep you posted on how this progresses. We’re working on the NDAL League Rules and Stipulations for a three-month league, August to October 2015. Later today I will send these Rules to all existing league teams; and make them available both on our blog and on Facebook for any new team that would like to join the league. What we’ve really lacked in the conduct of the league so far is a sense of drama and immediacy. To further these ambitions the Summer 2015 league will have some new timing rules; and the League Secretaries tasks will be refined. A new timing rule will require a league team to report their results for a given month’s league competition by midnight on the last day of that month. The league secretary will publish the results of an individual club’s league scores within three days of receipt of those results. As results continue to come in the cumulative results will be published showing a fair comparison of standing between clubs in the competition. Posted in Dog Agility Training | Comments Off on August League Course! You’ll note that the Fuller Brush Principle, according to my logic in 2009 applied largely to the dog. But don’t you know, I’ve decided that it applies in equal if not greater measure to the dog’s trainer and handler. I’ve observed this terrible phenomenon for many years now. An agility student will be introduced to advanced skills both in handler movement and dog training; and yet when in competition (hot water)… that student will return to “original shape”. That means he/she will revert to handling that is comfortable even though the handling is one-dimensional and assures results that are mediocre at best. As one of your constituents I am writing to ask you to support The 21st Century Glass-Steagall Act brought forth by Senators: Elizabeth Warren (D-MA); Maria Cantwell (D-WA); John McCain (R-AZ); and Angus King (I-ME). The act repealed by the Clinton administration allowed for the economic collapse, reinstatement of this act would be the first step in holding accountable the Banking Industry. Your support or lack thereof to this act WILL BE A DETERMINING factor in my continued support in the coming senate elections. Thank you for your time. A democracy is a powerful engine for change and sound government, so long as those who live in that democracy are engaged as voters and as citizens. Without engagement, you might as well be living in North Korea. The shape and angulation of the pipe tunnel tends to regulate the speed of a dog’s movement. An elongated pipe tunnel is an accelerator that will have both dog and handler on a dead run; while a u‑shaped pipe tunnel slows the dog down modestly and allows the handler who was firmly behind the dog as the dog goes into the tunnel to be magically forward as the dog comes out. This was a ripping fun course that ran very very fast. On the 4th of July we played in the rain at Sugarbush Farm. The twisty and technical opening of the Team / PVP Jumpers had a handler or two losing their footing. On this course the opening was like drawing back the hammer on a pinball machine. As the dog turns around at jump #6 the ball is released and the handler had better have on his track shoes. In the turn off of the spread hurdle at #11 The #14 pipe tunnel mercifully allows the handler to gather up his dog, and finish with a flourish. It’s a bit ironic that the gathering bit in this course probably caused more faults than the technical opening. Prematurely cuing the turn at #11 set up opportunity for dropped bars and refusals (especially if the handler is well behind and not encouraging the go on). Then, coming out of the #14 pipe tunnel, both of the next two jumps were candidates for refusal. The handler needs to see the change of directions on the dismount of the tunnel, giving a clear path to the #15 jump. Oh, and an interesting note, the turning radius of fast long-striding dogs tends to create a unique consequential path for the dog. Make of this picture what you will. 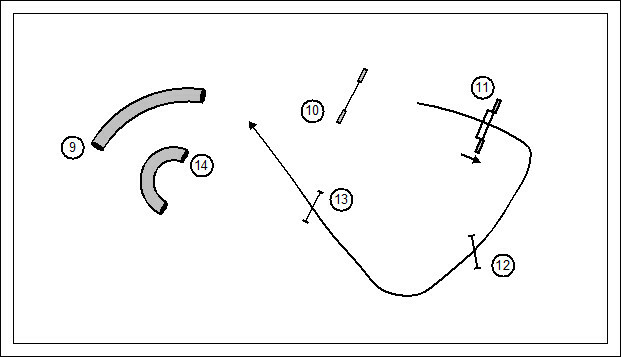 The threadle opening of this course was a deliberate attempt to limit the grind of the lead-out. Many handlers will take as long to do a lead out as they take to run a course. And most of it is just plain flawed science. The opening should be step… step… release. The ploy was more of a suggestion than a demand. It’s amazing how many handlers will lead out and then mindlessly come to a stop. Really? You want to get caught flat-footed on a threadle? Judging a trial on courses of your own design demands that you are a student of the game. There are lessons to be learned in the conduct of every turn and sequence. The night of every trial I am scribbling notes and attempting to balance what I’ve observed with my conceptual universe of the game we play. One of the notes I wrote on Sunday night… that trick at the start line, where the handler has the dog come up from behind and between her legs; the handler should be wearing slacks, and not a skirt. You are currently browsing the Bud Houston's Blog blog archives for July, 2015.